Planet Scuba is a unique scuba retailer recognised for choice and value. We have a wide range of scuba equipment and accessories. We also specialise in INON underwater camera equipment and are able to offer photography courses on the use of your cameras. As a dive centre we offer the full package by training divers, selling equipment, servicing and scuba travel for the divers. Our shop in Bishops Stortford has been built on the knowledge and professional standards that we as divers set ourselves. We have over 10 years experience working with schools and College groups, both internationally and in the U.K. We are able to offer a diverse range of off-the-shelf & tailor-made adventure packages to fit your needs and budget. We are convenient for Hertfordshire, Cambridgeshire and Essex as the dive shop is Just off J8 of the M11. We offer the full range of PADI scuba diving courses and great value equipment. Planet Scuba is owned and managed by Stephen Manton, and all courses are run to the highest standards with our team of experienced PADI Instructors.Planet Scuba has been training divers for over 15 years and qualifying people in the full range of dive courses from Discover Scuba to Instructor. We have a wealth of experience. providing a safe and fun experience is our main aim. 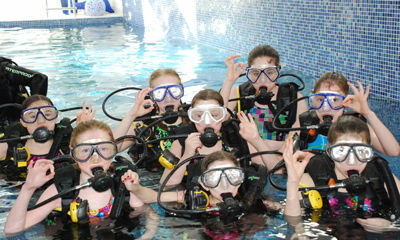 We have a fantastic team of highly experienced Instructors working with schools and colleges.